The moment you sign up for the music streaming service Spotify, you lose some very important rights -- and Spotify wants to bury what you're losing in the fine print. Spotify specifies that when listeners click "sign up," they agree to its terms and conditions -- found on a separate page of the Spotify website. Buried in the fine print of those "terms and conditions of use" is a forced arbitration clause. As the ad says, that means that if you have a dispute with Spotify, you have to take your case to a decision maker at a firm they choose -- not a judge or jury. In addition, if Spotify violates the rights of thousands, even millions, of its listeners, they can't band together to seek justice. Clicking "sign up" shouldn't mean Spotify listeners lose their chance to stand up for their rights in court. We believe consumers deserve to know what they're giving up in the fine print. Being forced into arbitration is like playing a baseball game in which the other team hires and fires the umpires. It's no wonder one study found that arbitrators at one firm ruled against consumers 94 percent of the time. Earlier this month, the federal Consumer Financial Protection Bureau released an extensive study that found that three of four consumers did not know if they were subject to a forced arbitration clause. CFPB found that forced arbitration is a bad deal for consumers in all sorts of ways. We want Spotify to remove its forced arbitration clause. 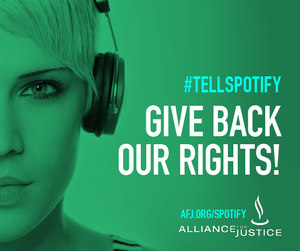 Please sign the petition on AFJ's website and join our coordinated social media campaign, using the hashtag #tellspotify. 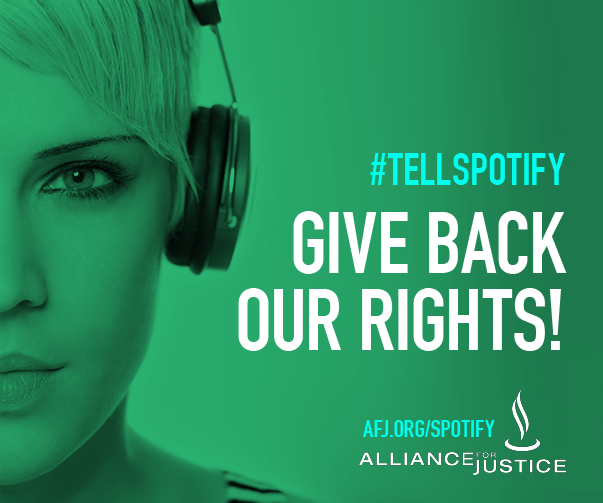 With your support, we can raise the issue of forced arbitration with Spotify and ask them to give back our rights. Spotify is not the only company to impose forced arbitration. Other online services like Netflix, Instagram, and Hulu apply the same practice. And it's spreading beyond consumer contracts into employment agreements, undermining some of our most cherished civil rights laws. But there is potential for improvement. General Mills, for example, removed forced arbitration from its terms and agreements, demonstrating that it is possible for Spotify to follow suit. It's all explained in AFJ's short documentary Lost in the Fine Print. Spotify bills itself as "music for everyone." It's time for Spotify to live up to that promise and be a leader in the entertainment community. We encourage Spotify to rethink its use of forced arbitration in its terms and conditions and give its listeners back their rights. As we say in the ad: "Enough with the fine print, we just want to enjoy the music."